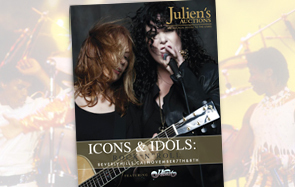 Julien’s Auctions presents a unique online only entertainment auction that will occur twice a year in the Spring and Fall prior to our premier live auctions. 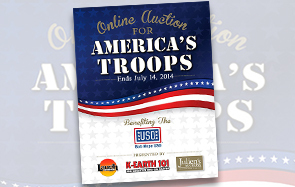 Julien’s Auctions in partnership with K-Earth 101 and The Laugh Factory is proud to present the 2014 online charity auction to benefit The Bob Hope USO and America’s Troops. 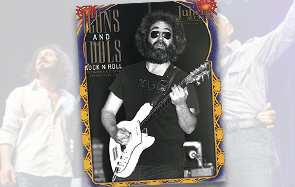 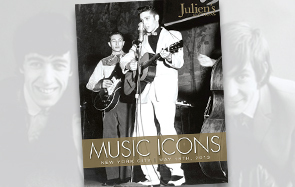 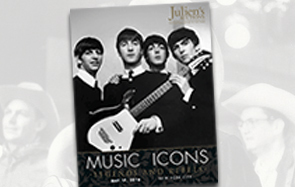 Julien’s Auctions returns again to the Big Apple for the music memorabilia auction of the year at the Hard Rock Cafe in Times Square on May 17th, 2014. 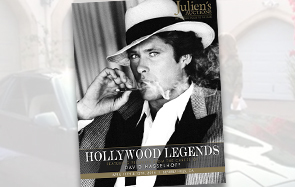 Julien’s Auctions is pleased to announce our annual Hollywood Legends auction featuring Property From The Career of David Hasselhoff taking place on Friday, April 11th and Saturday, April 12th. 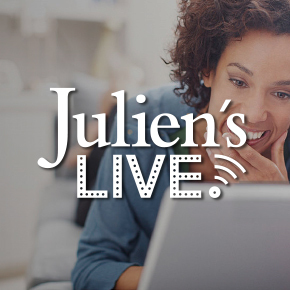 Julien’s Auctions presents a unique online-only entertainment auction. 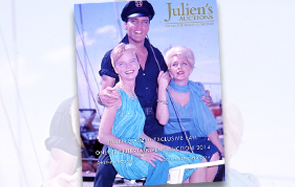 The Julien’s 90210 Exclusive Spring Online Entertainment auction will run through Monday, March 17th. 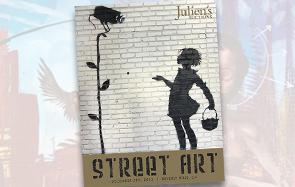 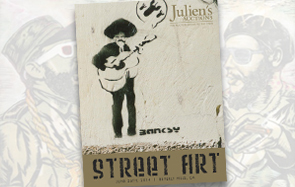 On Thursday, December 5th, 2013, Julien’s Auctions will host its inaugural Street Art auction event featuring the sale of Banksy’s Flower Girl mural. 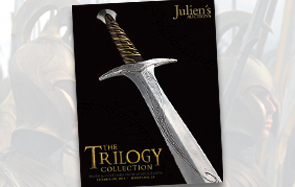 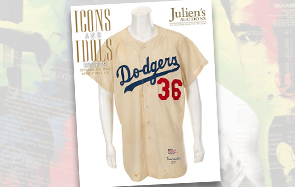 You are invited to join Julien’s on November 9th and 10th, 2013 for an auction of staggering depth and breadth of Hollywood and Celebrity memorabilia. 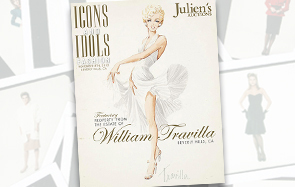 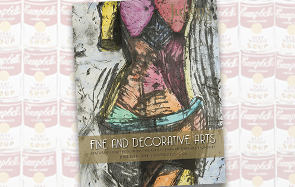 Julien’s Auctions is proud to feature Property From the Estate of William Travilla as part of the Icons & Idols: Fashion auction on Friday, November 8th, 2013 at the Julien’s Beverly Hills Gallery. 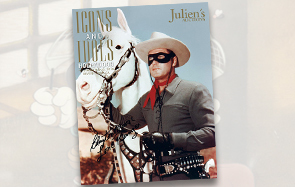 Julien’s Auctions invites you to attend the auction of one of the greatest pioneers of television comedy. 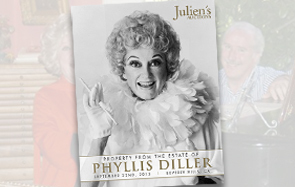 On September 22, 2013, join Julien’s as we present Property from the Estate of Phyllis Diller. 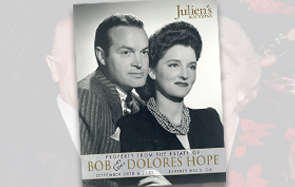 On Friday, September 20th and Saturday, September 21st, 2013, Julien’s Auctions will host a landmark auction event with the sale of The Personal Property, Antiques and Memorabilia from the Estate of Bob and Dolores Hope. 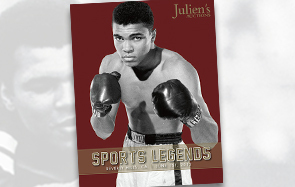 Featuring Selections from the Harlan Werner Muhammad Ali Collection, and the Whalen “Whaley” Monica World Series and All-Star Game Collection.